Rose is the flower of love, beauty + happiness. You are uniquely beautiful. Be happy knowing that you are loved exactly as you are. This mala is handmade using the gemstones Rose Quartz, Amazonite & Lodolite. 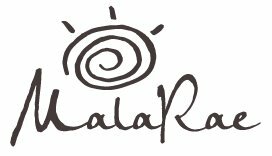 Handmade Malas – MalaRae is a unique mala company based in the Ottawa region, is your best choice. Amazonite is an excellent aid to improve communication and is believed to dispel fear and anger. It is often turned to for encouragement to take charge of one’s life and connect with one’s inner power. It is also know to support the thyroid and help soothe the nervous system. Amazonite is known to heal the throat chakra. Lodolite is often referred to as the “Shaman” stone. It is said to enhance communication with beings on the spiritual plane and heighten one’s spiritual energies. It is used mystically to increase ESP and bring knowledge from your past lives. Lodolite is said to bring in loving energies and energies of gentle strength. Lodolite is associated primarily with the crown chakra. My favorite piece of all! When I saw the photo of this beauty created by Kyla while she was travelling in St-Martin if I recall correctly, I contacted her right away to get my hand on that piece asap. 🙂 I almost feel the softness of the ocean breeze on my skin wearing it.